WebFilm® is an online CMS (Content Management System) for making multimedia presentations and digital content available on the internet. Reach a public audience by creating a slideshow about the site. Store equipment manuals that can be downloaded by maintenance staff for quick access throughout the project life. Store drawings and related documents with a password for future reference. 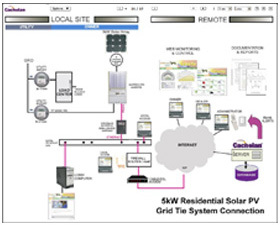 Each SolarVu® energy portal comes with a WebFilm® account for creating a slideshow and online document storage. As part of the initial setup, supplied photos will be put into the SITE screen slideshow by Cachelan. Customers can modify the online slideshow any time by logging into WebFilm® within SETUP and uploading/arranging new pictures. A tutorial is available to facilitate learning how to use WebFilm®. Troubleshooting problems long after site commissioning requires access to system documents like instruction manuals, electrical drawings, roof layouts etc. Often these may be hard to locate in a timely manner. To save valuable time, these can be uploaded into the secure WebFilm® Vault and viewed online or printed when needed using password login through SETUP.